The Short Version: Situated on a bluff overlooking the Hudson River, Frederic Church’s Olana is a 250-acre marvel in the state of New York. The panoramic views, historic studio, and quaint carriage roads immerse visitors in the beauty captured by Frederic Edwin Church, an influential American artist active in the late 19th century. Today, his home and artist-designed landscape have become a state park and historic site open to the public. You can visit the landscape for free or book a tour of the house or property to see how the Church family lived. Frederic Church’s Olana is a favorite date spot among locals because of the scenic vistas that surround the property. If you’re looking for an idyllic place to propose or a quiet spot for a picnic, you can come here with someone special to have picture-perfect moments inspired by the visually stunning Olana. Frederic Edwin Church was the first American artist to achieve international acclaim for his landscape paintings. He was a world traveler: he and his wife spent a year and half in Europe and the Middle East. He was an adventurer: he visited the Andean Mountains twice to see equatorial volcanoes along the cordilleras. Yet he was also a family man who moved into a cozy little farm cottage after he got married and raised his family in the Catskill Mountains of New York. Frederic Church married a young beauty from Ohio named Isabel on May 14, 1860, and they stayed together until she died in 1899. Frederic passed away just three months after losing his beloved wife. The couple had six children — two died early in childhood, and the other four were raised in Olana. Today, over 170,000 visitors a year come to Frederic Church’s Olana to see the landscapes that inspired him to paint some of his most renowned works of art. Olana is a public park and historic site, and it’s free to visit the property, but you can elevate your trip by attending a ticketed event or tour of the house or landscape. 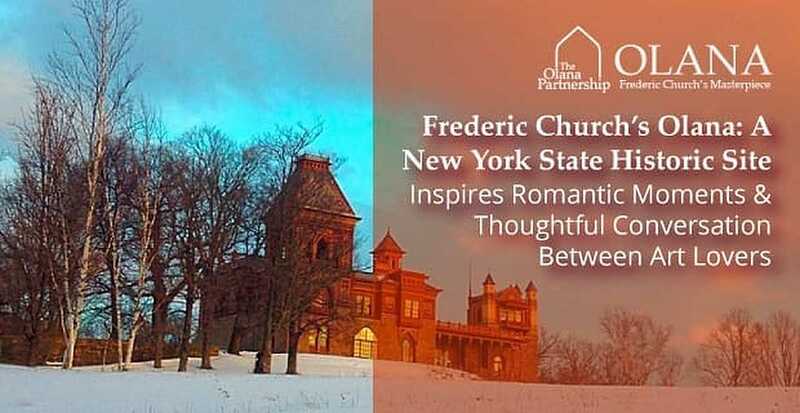 People come from all over the world to look at Frederic Church’s art collection, picnic on Olana’s restored landscape, and learn the history behind this breathtaking spot. Many couples make a day of going to see Olana and walking along its picture-perfect green spaces. When Frederic Church bought Olana, he had an artistic vision in mind for the place. He transformed it into a beautiful work of art where visitors can see awe-inspiring natural vistas of the Hudson Valley. Frederic planted thousands of trees on the 250 acres of land, built a lake from swamp land, and carved more than five miles of carriage roads so visitors could witness his artist-designed landscapes. He also did his best to turn the farm into a place of quiet inspiration and contemplation. Taken as a whole, Olana is one of Frederic Church’s great works of art. American artist Frederic Edwin Church painted “Apple Blossoms at Olana” in 1870. Frederic observed the changing of the seasons from many different perspectives at Olana, and he painted the best of what he saw. 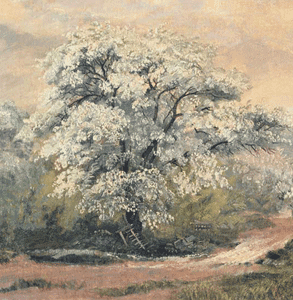 In 1870, he painted his orchard awash in white apple blossoms and later compared the work to his bride. He put a lot of his heart into his work, and his deep love of nature can be seen in his brushstroke. Now Frederic Church’s Olana opens its doors to other artists and romantics seeking inspiration. You can not only see his house — complete with a collection of nearly 800 paintings — but you can also explore the surrounding 250 acres of landscape, complete with scenic views of the Hudson River and the Catskills. Frederic Church’s Olana is open to the public all year round so you can take in panoramic views of snowy mountains or blossoming fields. If you take a date to this relaxing getaway, you’ll have plenty of gorgeous photo opportunities at this state-owned park and historic site. The tours are the main draw for visitors of Olana. You can book a self-guided tour, a historic landscape tour, or a house tour — but you should book early because these tours tend to fill up. 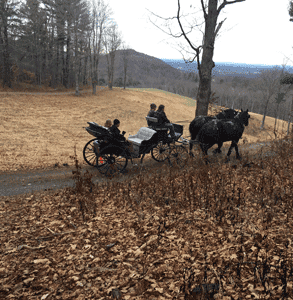 The landscape tour includes a ride on an electric carriage through Olana’s winding carriage roads. You can check out amazing views as you sit in the backseat with your loved one. The Question Tour is another popular way to see the main house and learn about Frederic Church’s life and works. These tours invite conversation by encouraging participants to ask questions. Daters can take a Sunset Carriage Tour on certain Fridays from June to October. If you’re visiting in the spring, summer, or fall, you can check out Olana’s annual exhibitions. This year’s will showcase the never-before-seen clothing Frederic Church brought back with him from the Middle East. From summer parties in July to food trucks in October, Olana has plenty of date activities for couples to enjoy together. Anyone looking for something fun to do on the property can go into the Adventure Tent to get a creative idea. A machine spits out a receipt with an activity on it. Couples can take the idea and run with it. The tent, designed in collaboration with New York Times bestselling author Keri Smith, gives guests fun assignments so they can always find something to do at Frederic Church’s Olana. Daters turn out in droves for the Artists on Art tour, which features a contemporary artist as the guide. Olana hosts these tours two Saturdays a month from June through November. The tour begins at 5 p.m. and ends at a scenic spot on the piazza where guests can sip wine and watch the sunset over the Catskill Mountains. 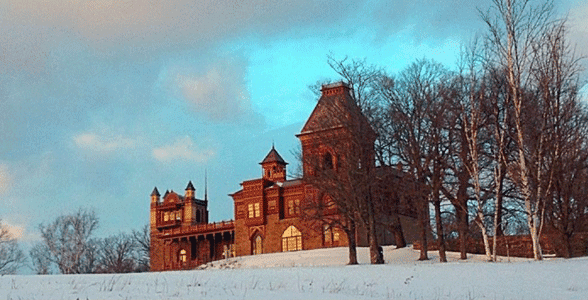 Of course, you don’t have to take the tour to watch the sunset over the Catskills from Olana. On clear days, many couples head to the public park in the evening to stake out a romantic spot to watch the sky become a beautiful blend of reds, oranges, pinks, and purples. The Olana Partnership and the New York State Office of Parks, Recreation, and Historic Preservation work together to make Frederic Church’s Olana a beautiful and educational place for the public to visit. This partnership has been going strong for over 50 years now. The staff feels passionately about the importance of their efforts to restore, preserve, and improve Olana for future generations. They’re currently working to restore the landscape, with the help of Thomas Wolz, a talented architect who worked on Thomas Jefferson’s Monticello. Over 254,000 people a year take a tour of Olana’s main house and art collections. Sean said many of The Olana Partnership’s team have artistic interests, and that’s what inspired them to work at Olana. Some host guided tours 20 hours a week and then spend the rest of their time working as a collage artist or experimental musician. Many team members are local New Englanders, like Sean, who grew up in Vermont, went to school at Princeton, and fell in love with Frederic Church’s Olana. You’ll often see couples strolling hand in hand down the pathways of Olana. A few times a year, you may even see a wedding taking place on the landscape. Frederic Church’s Olana is in high demand among local couples, but Sean said the staff tries to limit the number of weddings they host because they don’t like roping off swaths of the property from the public. After all, Olana was intended to be enjoyed by everyone. When you visit Frederic Church’s Olana, you’re surrounded by the natural beauty of the Hudson River Valley. Couples can appreciate the scenic area while picnicking on the lawn or strolling the area. Whether you want to take a carriage ride through the 250-acre property or explore the artist’s studio and home, you can find many different date activities to enjoy alongside that special someone. The exhibitions, sunset tours, and art collections provide plenty of conversation starters as well as a quiet atmosphere where daters can escape the daily grind and recapture the romance in their lives. “We see Olana as a place of continuing artist inspiration so that’s the core of all we do,” Sean said. “It’s this incredibly special place to come and spend a day, have a picnic, and really revel in nature — seen through the eyes of one of America’s greatest painters.